The Saturday of the Summer Day meeting at Colyford was indeed a lovely summer’s day. On arrival it was reassuring to be greeted by a nice gentleman directing the car parking. Our chairman Sue Enderson welcomed everyone. The first speaker, Ruth Murray, gave us much food for thought with her talk on Fair Trade Fabrics. She explained how the law of supply and demand and restrictive trade practices adversely affected fortunes of the poor cotton farmers. One of the “shocking facts” she told us was how the USA pay illegal subsidies to their cotton farmers which still continue despite two international court rulings against them in actions brought by Brazil. There are also problems with forced child labour in some of the poorest areas. On a brighter note Ruth went on to tell us about the development of ethical fair trade cotton with Agricol India organising farmers groups and introducing organic practices. It was good to hear that a West Country company, Bishopston Trading Co, has been providing fair conditions for Indian weavers for 25 years. Ruth then showed us some quilts made with the beautiful vegetable dyed fabrics and said that one of her future projects is to help the weavers print fabrics which will give them another skill and also provide us with more wonderful fabrics. There was a short ‘show and tell’ by members and then the lunch break provided an opportunity to enjoy the sunny weather and also to browse and spend money on the stalls. 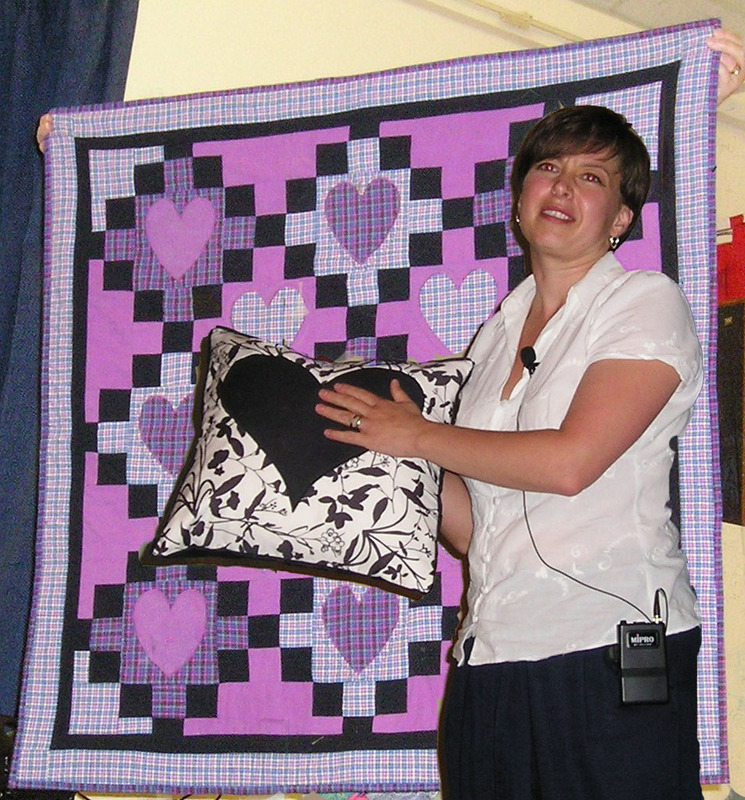 The afternoon talk was given by Angela Madden who delightfully described her quilting journey from paper pieced hexagons which she used in her role as an occupational therapist through to the stunning portrait quilts of today. 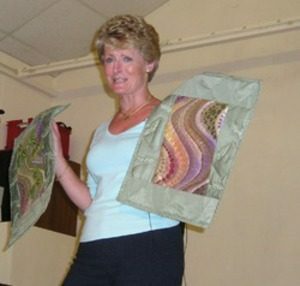 After a revelatory visit to a quilt shop in America 30 years ago Angela realised the infinite possibilities patchwork could offer and as she has an Irish family background she began to experiment with Celtic design, even developing her own tools. Then, whilst telling many amusing anecdotes, she showed examples of her work, stressing that they were all done the ‘easy way’ and on a machine. Angela’s journey then took her into the realms of strip pieced landscapes with intricate borders giving them added dimension. One of her books ‘Pieceful Scenes’ illustrates this technique well. The ‘Tall Ships’ quilt was particularly impressive as was the reversible parabolic waistcoat. 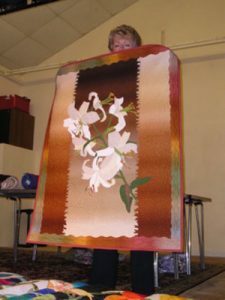 The next quilts were the Floral Bursts with bold, stunning poppies and elegant lilies to name but two. These quilts showed gold bias, raw edge bias and various embroidery techniques using variegated thread. Lastly, but definitely not least, were the portrait quilts which were true works of art and left us all immensely impressed. This was an extremely entertaining and informative talk. Sue wound up the meeting with various notices. It was a thoroughly enjoyable day.